Hey everyone I haven't posted anything recently but I thought I would post the "Obvious", hehe. I just wanted to add that along with the original art I sell on my Laurenmdavisart Ebay account, Laurenmdavisart ETSY account and images on items at my cafepress shops. I also do commission paintings and would love to do one for you or yours. All types of pets are welcome, All I need is a picture or good description, etc and we are set!! For more info about canvas type, prices and sizes please feel free to email me at LiLseahorses@yahoo.com . 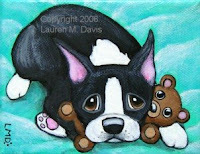 Or you can go to my EBSQ site by Clicking here http://lmdart.ebsqart.com/ and then clicking on the "Commission" TAB. Also please be sure to click on my "Portfolio" TAB to see a bunch of my past sold paintings aswell as past commission pieces. Thanks so much everyone!!!!!!!!!! strike me down how cute is your profile picture! I would assume you made that if so AWESOME JOB, and if you didn't great marketing becuase it brought me right into your lovely blog to view you great work. Thanks for sharing. Hey Step!! Thanks so much for the sweet comment!!! Yep I made that painting (it's of my cat Sharky). He's never been to the beach but I'm sure he dreams about it hehehe.